The science of archaeology has undeniably enriched mankind’s history and has helped to quench the quest to understand our past cultures in a better way. Understanding the age and period of existence of the excavated fossils and other organic objects will help the archaeologist to unravel human history and evolution in a scrupulous manner (Taylor 24). Archaeologists utilize one of the revolutionary methods called the radio carbon dating to determine the approximate age of the organic materials including plant and animal parts up to 50000 years (Long). Radiocarbon dating technique is primarily based on the radioactive decay of Carbon-14 isotope. Developed by a team of researchers under the leadership of Dr. Willard Libby, this technique had revolutionized the way the archaeological advancements are made in learning about the past civilization and cultures, changes occurred in the earth and in its climate. Radiocarbon dating enable archaeologists to provide proof of authenticity to the excavated artifacts’ period of usage and thus by collaborating with the efforts with historians and anthropologists, the unwritten history can be precisely explained. Desmond Clark (1979) opinions that if radio carbon dating technique were not discovered, “we would still be foundering in a sea of imprecisions sometime bred of inspired guesswork but more often of imaginative speculation” (Clark, 1979:7). According to Higham (1999) C14 method can be described as ‘the radio carbon revolution’ which has significantly impacted our understanding about evolution and also cultural emergence of human species. Taylor (1987) suggests C-14 technique as one of the most significant discoveries of 20thcentury that touches the realms of many disciplines including archaeology. Prior to the development of radiocarbon dating it was difficult to determine the age of the artifacts unless it was accompanied with some chronologically specific things like a coin. Otherwise archaeologists had to resort t to the method of relative dating where by comparing with stratigraphically close objects [objects which are buried at the same depth will be approximately of the same era.] clue regarding the time period and historical styles were assumed or rather guesstimated. But the advent of carbon-14 dating tools has opened up the new scope of absolute dating where scientists could predict the age of excavated artifacts and objects with great precision up to 50,000 years old. For example, if a tree was found to be used in an excavated piece of architecture, by determining the age of the tree or the period when the tree was cut down for construction, the era to which the excavated architecture exactly belongs can be estimated (Michels, J W). Archaeologists rely on the various radiometric dating techniques- based on the radioactive properties of unstable chemical atoms to determine the age of the materials. Researchers from the field of Physics have discovered that radioactive molecules are unstable and they undergo decay to attain a stable structure at a specific rate which is directly determined by the atomic number and mass of the decaying atom (Polach, H.A and. Currie, L.A). Based on this constant of the radioisotope of carbon, 14-C or carbon -14 the age of the organic material is assessed. 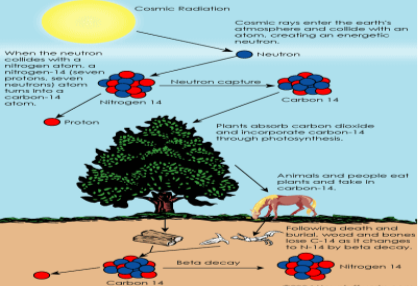 In the biosphere carbon-14 is created by the collision of a neutron, exited by the cosmic ray collides with a nitrogen atom. The isotope of carbon thus produced is radioactive and it will undergo decay at a constant rate (Berger and H.E Suess). The carbon isotope is also absorbed during photosynthesis by plants and reaches animal body when they consume plant parts. It also reaches the organisms through respiration along with normal carbon-12. It is assumed that in a living object carbon-14 which undergoes decay is replaced at a steady rate. The carbon dating technique takes the assumption that all livings have fairly same percentage of 14C isotope in their body and also that the ratio of carbon-12 to carbon -14 present in the biosphere and inside the living plants and animals remain constant. After the death of the organism the carbon intake is stopped. Then the amount of carbon-12 in the body will not reduce but the amount of carbon-14 undergoes reduction due its radioactivity. Carbon-14 isotope will undergo decay at an exponential rate to form the stable nitrogen-14.Thus by comparing the relative quantity of carbon -12 and carbon -14 in an organic matter excavated scientists can predict the age of the object (R.E Taylor and M.J Aitken). The following equation is used to determine the carbon-14 decay. Where N is the current amount, N_o is the original amount, lambda is the proportionality constant for the growth rate (which is negative for decay), and t is the amount of time that has passed. Figure: 1 Carbon -14 lifecycle. The half-life of carbon-14 is 5730 years. This implies that it takes 5730 years for half of the 14C atoms in the organic matter to get decayed. When an organism is dead the intake of the carbon-14 stops and in a 5730 year time period, half of the amount of carbon-14 present in the organic matter would have undergone beta decay to form stable Nitrogen-14. The burning of a small piece of the excavated organic matter and measuring the electrons emitted during the process by the decaying carbon-14 by radiation counters enable to quantify the amount of carbon -14 present in the material. This data will help the scientists to relationship of Nitrogen-14 and Carbon-14 atom and can be used to predict the age of the artifact directly. This method assumes that the ratio of C-14 to C-12 in the atmosphere and in the living organism will be a constant. But studies have showed a slight fluctuation in this ratio over the millennia and hence there is a possibility and consequent discrepancy in calculation too (Currie). Another limitation is the difficulty in estimating the age of things which are older than 50000 years as the amount of C-14 in such samples become absolutely undetectable due to complete decay. Despite all the limitations radio carbon dating will remain as a significant tool for archaeologist around the globe to compare and understand the evolution of human culture and civilization. Advancements in this field like accelerator techniques of carbon-14 dating (C. Tuniz, J.R Bird, D.Fink, and G.F Herzog 60) conducted with the help of mass spectrometer have increased the range of the technique up to 100000 years (Nave). Thus undoubtedly radiocarbon dating remains one of the significant tools for the archaeologist to explain the evolution and cultural emergence in a more accurate manner. Brain, Marshall. “How Carbon-14 Dating Works.” 03 October 2000. HowStuffWorks.com. <http://science.howstuffworks.com/carbon-14.htm> 18 March 2009. Clark, J.D. Radiocarbon Dating and African Prehistory. In, Radiocarbon Dating. Proceedings of the Ninth International Conference, Los Angeles and La Jolla, 1976. Higham, Thomas. “The Method.” 1999. http://www.c14dating.com/int.html.04 Nov 2014. Long, Kelly. “Why Is Radiocarbon Dating Important to Archaeology.” California State Parks.<http://www.parks.ca.gov/?page_id=24000> 1 March 2009. Michels, J W. Dating methods in archaeology. Seminar Press, 1973. Nave, R. “Accelerator techniques for carbon dating.” <http://hyperphysics.phyastr.gsu.edu/hbase/nuclear/cardat.html>15 April 2009. Polach, H.A and. Currie, L.A. Exploratory analysis of the international radiocarbon cross- calibration data: consensus values and interlaboratory error. Preliminary note. Radiocarbon,. 1980: -35-933.Print. Taylor, R.E. 1987. Radiocarbon Dating. An archaeological perspective. Academic Press, Orlando, USA. Tuniz, J.R Bird, D.Fink, and G.F Herzog.. Accelerator Mass Spectrometry: Ultrasensitive analysis for global science. CRC Press. 1998. "Radiocarbon Dating in Archeology." UKEssays.com. 11 2018. All Answers Ltd. 04 2019 <https://www.ukessays.com/essays/archaeology/radiocarbon-dating-in-archeology.php?vref=1>. "Radiocarbon Dating in Archeology." All Answers Ltd. ukessays.com, November 2018. Web. 25 April 2019. <https://www.ukessays.com/essays/archaeology/radiocarbon-dating-in-archeology.php?vref=1>. UKEssays. November 2018. Radiocarbon Dating in Archeology. [online]. Available from: https://www.ukessays.com/essays/archaeology/radiocarbon-dating-in-archeology.php?vref=1 [Accessed 25 April 2019]. UKEssays. Radiocarbon Dating in Archeology [Internet]. November 2018. [Accessed 25 April 2019]; Available from: https://www.ukessays.com/essays/archaeology/radiocarbon-dating-in-archeology.php?vref=1.